How it could unfold… resonance…. This month I’m cast in a play based loosely on an actual event of July 1921, in which America’s self-effacing President, Warren G Harding, goes camping with Henry Ford and Thomas Edison. The play centers around a fictional side-trip in which the three men sneak away from the media-packed campsite and get lost in the woods. Their dramatic interactions reflect what was going on in their lives and in America at the time. 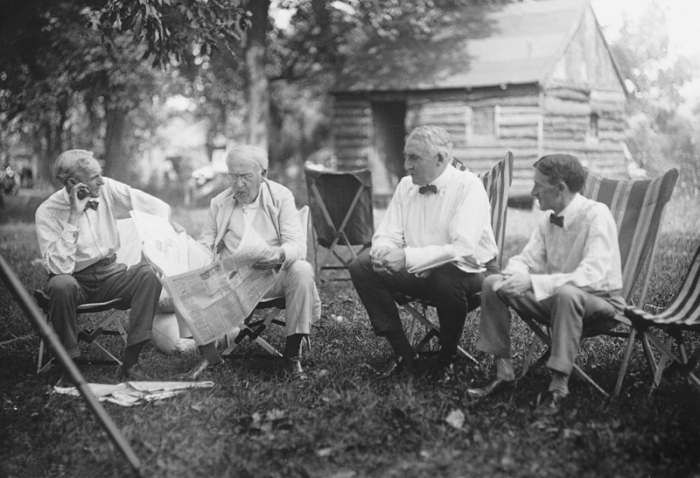 From left, automaker Henry Ford, inventor Thomas Edison, President Warren G Harding, and tire magnate Harvey Firestone on one of their camping trips in the early 1920s. I play the part of Edison, age 74. Excerpt from an ad apparently placed in The Saturday Evening Post magazine around the end of World War I, when Ouija Boards and seances were all the rage in the US. Seems like everything I’ve done in life has been leading up to this point… not the play, but the coming Golden Age of ITC, or instrumental transcommunication, the use of technology to get in touch with the other side. Thanks (perhaps) to Henry Ford’s coaxing, Tom Edison tried to crack the door open nearly a century ago… and a lot’s happened since then. Much has been learned about how to establish a contact bridge with the other side. Looking back over my life, it seems that even while I vehemently denied the afterlife (up until near-fatal colon cancer got me to reconsider) I was unconsciously working toward a Golden Age of ITC. Psychic mediums play an important role, conveying from spirit some basic rules about how to set up the equipment, which becomes integrated with the consciousness of the experimenters. For example, there has to be a deeply held belief or knowing that the afterlife is real and that ITC is possible, before spirit entities can manipulate the electromagnetic energies surrounding our radios, TVs, computers, telephones, and other equipment to make amazing things happen. Once the contact field has been established, a stable ITC bridge can now be developed with less reliance on mediumship, and human beliefs become less important. ITC bridges can begin opening all around the world once researchers from the various ITC organizations achieve a unity of mind and spirit. That resonance among researchers is the main prerequisite for the “shaping” (angeformung) of equipment that can be operated from both sides of the veil without the reliance on psychic human channels. The third phase is what I would call the coming Golden Age of ITC. It will involve unity and resonance among researchers… and that’s the part that’s always been an interest of mine. Agreement among people, compatibility among groups, and world peace and unity have been at the center of my thinking and my writing since high school in the 1960s, when I first started thinking about social and political things. In a sense, then, I was trying to provide fertile soil for the growth of ITC even when the very notion of spirit communication seemed outlandish to me. In this series of articles I hope to explore some of the limitless rewards that the Golden Age of ITC will bestow upon the world… the steps that will have to be taken to get there… and the obstacles that stand in the way. This entry was posted in About Mark Macy, Heaven and Earth, Inner exploration, ITC, Our paradise destiny and tagged golden age of ITC, resonance, unity of mind and spirit. Bookmark the permalink. Although your article mentions a ‘fictional side trip’ wasn’t it a fact that Edison was trying to invent a machine to contact the dead? Dave, there’s some controversy about that, but the consensus is that he was in fact developing a machine that would have been, if successful, one of the very first ITC devices of this second Epoch. Mark – are you still working with other like-minded people across the globe on re-establishing a contact field? I look forward to this series because I’ve kept wondering “what next” (for ITC). At the very least – the work that was done is one of the best displays of “evidence too compelling to dismiss”. It is proof that “something” (or “somebody”) is out there that wants to communicate and help us. Hi David, I’m no longer working directly with others to establish a contact field. Writing everything I know about it is much, much easier for me than trying to sustain group harmony… as I discuss in the article I’m working on now (Part 2 of the series). That’s not to say that if the right opportunity were to present itself in the future………………. I’m one of those too. There appear to be several million of us (political junkies) here in the States… not all at the point of recovering, but we can hope………. 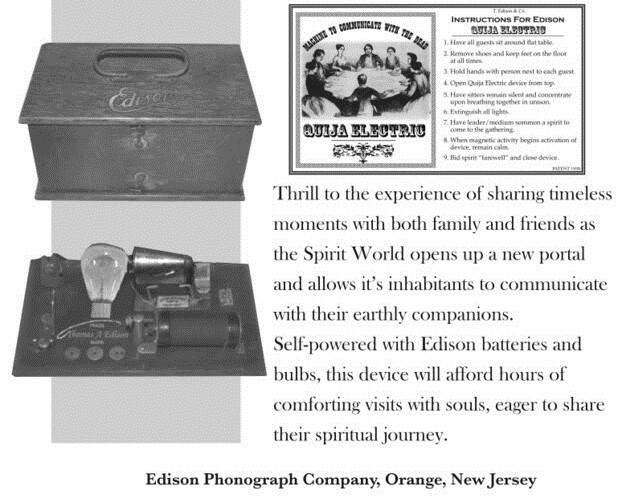 Thomas Edison I didn’t know created a device for the dead. Interesting! Hi Roy, more about that in this article……….